Hindutva &quot;bid&quot; to change Delhi&#39;s history: Why forget that that the Capital is a receptacle of many cultures? Hindutva "bid" to change Delhi's history: Why forget that that the Capital is a receptacle of many cultures? Delhi is not just a just a city or the capital of India; it is history itself. Who rules Delhi is important, not only in terms of today but for posterity as well. This is so as there is a conscious attempt to eliminate the past and forget its history. No other existing city anywhere in the world is as old as Delhi. The Pandavas set up their capital here; then called Indraprastha. As the story is narrated in Mahabharata, it dates back to a period of around 3000 BCE. The inner-family war not only ended the Pandava and Kaurava dynasties but also destroyed Indraprastha as well as Hastinapur and the regimes. A more modern Delhi became a citadel of Hindu kings who established their rule in 50 BCE in North India. Delhi was named after Mauryan king Dhillu. Much of Delhi’s ancient history is shrouded in myths and legends, not supported by any evidence except that Delhi today represents continuity and change. Many dynasties have ruled from here: the Nandas, the Mauryas (who defeated Alexander), and the Guptas whose rule ended in 550 CE. After these great empires ended, Delhi and its various regions were ruled by smaller kings and warlords. Notable among them were the Tomars, Gujjars, Chauhans etc. The Chauhan king Prithviraj was the last Hindu king who was defeated by Mohammad Ghori in 1192. Delhi thereafter was ruled by Muslims starting with Mamluks in 1206 and ending with Mogul dynasty in 1857, for nearly seven centuries. In all 32 rulers from 32 Muslim dynasties have ruled Delhi. Then the East India Company took it over from the Moguls following India’s First War of Independence. A little later the British Empire itself took over the company rule. Now there is a contrived effort to delete the past, especially the Muslim rule; hence, the bid to rewrite history and rename past symbols, especially roads, so that future generations remain unaware of it. This is the Hindutva bid at forgetting Delhi’s intermediate period of history. The Muslim rule over Delhi included Afghans, Arabs, Persian, Turks, Central Asian hordes, and several others. Then the British made Delhi the capital of their empire in 1911 and established Christian rule. Some roads named after British rulers have also been renamed. Why forget that that Delhi is a melange of culture, a receptacle of many cultures? Can one forget Delhi’s kulfi or British ice-cream? Delhi has adopted many things, either by consent or by coercion. It has not been able to retain its pristine culture except its harsh climate. Today, Delhi is not only a megacity but in reality a region comprising six cities: Old Delhi, New Delhi, Faridabad, Gurgaon, Noida, and Ghaziabad. Delhi is also the embodiment of diversity. In the process of change, Delhi was captured, destroyed, its citizens killed, women folk raped and taken away. So much so that it is said that following Nadir Shah’s invasion the water of Yamuna River remained red for days together since large quantities of human blood had flown into it. The occupiers and rulers of different era left their imprint not only on Delhi’s history and architecture but also on its cuisine. With so much of intermixing, Delhi does not really have even any cuisine of its own today. Delhi cuisine now is truly international. Name food from any part of the world, you have it in Delhi. From Iceland to New Zealand, to various African countries, Middle East, Far East, and of course European including British, Russian, Ukranian, American and Mexican. Besides, food from India’s own varied cuisine from states and union territories are available in this city. Delhi however has some things to offer in terms of its cuisine, though in modified forms, as it were. These include Delhi’s own Nihari, a sort of beef stew, and Daulat Chat made only in winter through a complicated process of condensing the milk foam. Then there are Delhi style kebabs, biryani, tandoori, and some modern items as butter chicken, aloo chat, dahi bhalla, kachori, gol gappa, keema samosa, aloo samosa, chole bhature, etc. Delhi’s drinks include lassi and Rooh Afza, and sweets like dodha and jalebi. 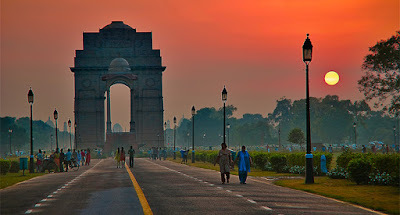 Thus Delhi, the cosmopolitan, is truly an international city blending its modernity with antiquity. The attempt to change it to a Hindu city or to vegetarian cuisine only is bound to fail.